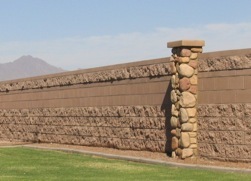 The Proto-II™ Fence Wall System is available in masonry fencing for 4”, 6” and 8” wide walls. 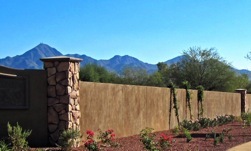 The Proto-II™ Fence Wall is stronger and more durable than conventional or segmental masonry systems and a far superior product than vinyl or wood fencing. The post tension design is a blend of efficiency and strength resulting in a superior, cost saving product. 4”, 6” or 8” wide Proto-II™ Fence walls can be built in lieu of competing conventional masonry walls, vinyl fencing or wood fencing. With the Proto-II™ Fence Wall System, significant savings and superior structural integrity are realized without any compromise in appearance. Retaining capability from 16" to 2'8"